Kineticism, as an artistic movement, concentrates on the study of movement based on the ambivalence of perception. Its birth can be traced back to the 1955 exhibition “Le Mouvement” presented at the Denise René Gallery in Paris. 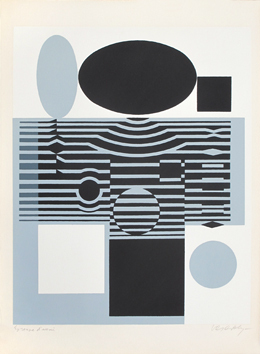 Vasarely, who had been working in Paris for some time, was one of the forces behind this memorable show. That same year, he formulated the basic ideas and principles of the movement in his Yellow Manifesto, “Manifeste Jaune”. Some research groups were formed and the movement expanded through Europe and eventually spread to the United States and South-America where it slowly took on new directions. In 1965, “The Responsive Eye”, a large exhibit shown at the Museum of Modern Art in New York, was the starting point for the movement to embark on a new American adventure; it reinvented itself into Optical Art, Op Art, a pictorial movement dedicated to suggesting movement without ever really depicting it. Artists not in gallery : Nicolas Schöffer (cybernetic art), Larry Poons, Bridget Riley, etc. Artists in gallery : Sato Ado, Yaacov Agam, Josef Albers, Getulio Alviani, Cesi Amoretti, Alexander Archipenko, Agostino Bonalumi, Antonio Calderara, Enrico Castellani, Geneviève Claisse, Carlos Cruz-Diez, Franco Daleffe, Piero Dorazio, Yves Dubail, Julio Le Parc, François Morellet, Luc Peire, A. Pizzo Greco, Romano Rizzato, Antonio Scaccabarozzi, Nicolas Schöffer, Eusebio Sempere, Jesus-Rafael Soto, Franck Stella , Vassilakis Takis, Günther Uecker, Victor Vasarely, Jean-Pierre Yvaral.